Cows, pigs and chickens may not rule the roost in most companies, but when it comes to keeping pace with advancements, the agriculture industry is as much cutting-edge - sometimes even moreso - than mainstream businesses. Just ask Aidan Connolly, the new chief innovation officer at Alltech a leading global animal nutrition company headquartered in Lexington, Kentucky. Aidan Connolly, Chief Innovation Officer, Alltech. His mission: to "future-proof" upcoming agricultural innovations so that measures implemented today have a better chance of remaining commercially relevant five, 10, perhaps even 20 years down the road. Without a crystal ball, that’s pretty hard to do, especially given the warp speed at which today’s technology can render a new product, service or model obsolete almost before it hits the market. So corporate America has reacted with its own power play: the chief innovation officer (CIO), one of the more recent additions to the C-level suite. CIOs wake up every morning with one persistent thought looping through their brainwaves: how to out-innovate the Bill Gateses and Steven Jobses of the world. For Connolly that process takes place on a unique playing field - the world’s farmlands. His mantra is to ensure that products, services and technological systems in the ag pipeline won’t need to be significantly updated as technology advances. To accomplish that, he works closely with Alltech’s 90 scientists and 250-person research team to “future-proof” its endeavors. “My role is not to run research but to bring commercial insights to the research team and make sure that our research is commercially relevant,” said Connolly, an Alltech vice president who has been with the company 25 years. He also teaches marketing at UC Dublin’s Smurfit School and agribusiness at China Agricultural University in Beijing. 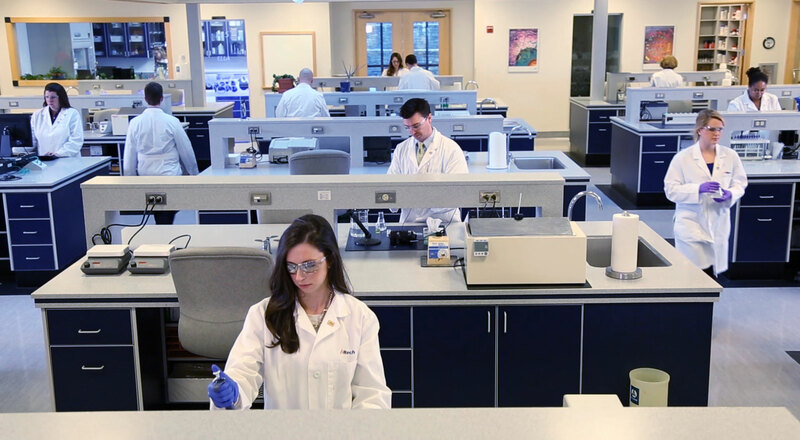 At Alltech his focus centers mainly on what is known as “incremental innovation” rather than “fundamental innovation.” The distinction: Fundamental innovation means creating something that has never existed before. Incremental innovation takes something that already exists and improves it. Therein lies Alltech’s strength, said Connolly, pointing to the burgeoning needs of the world’s food supply, with a projected nine billion mouths to feed by the year 2050. “There is a gap between current (animal production) performance and genetic potential, which Alltech can bridge. Today we know that cows and chickens generally underperform compared to their genetic ability by about 30 percent,” he said. In other words, an animal that is producing 100 units of milk, meat or eggs should be producing 130. Alltech researcher Allyson Lovell performs feed analysis as part of Alltech's True Check in-vitro screening system used to help optimize pig and poultry diets. It’s not just a matter of productivity, however. Increasingly, said Connolly, consumers are demanding that food be more sustainable and that production animals be kept in conditions that are welfare-friendly. “Tasty food, meat quality and the environmental impact of what we do are all very important,” he said. Alltech has been committed to addressing those concerns for decades, added Connolly, but the concept took time to grow roots. He recalled the reaction in 1989 when Archimede Mordenti, a professor and featured speaker at the annual Alltech International Symposium, proposed that the agriculture industry should be “A-C-E”- animal, consumer and environmentally friendly. In this robotic milking system, cows milk themselves whenever they are ready. Cows approach the equipment, lasers detect the location of the udders and milking can begin automatically. A future-proofing initiative currently on Connolly’s plate involves studying the top 50 food companies in the world to find out what they envision as challenges they will face in meeting the future demands of consumers. “I’m excited because I think it fits very well with some of the innovations we’re involved with. I think this is the direction we want to take,” he said, adding that Alltech has refined its focus to 80 key questions and eight categories within those questions. The study is expected to be part of the discussion during the Alltech REBELation in Lexington, Kentucky, from May 16-20. Aidan Connolly leading sessions on the future of agriculture at Alltech's 30th International Symposium, a global meeting of leaders in the agriculture and food industries which takes place annually in Lexington, Kentucky in the USA. Connolly noted the recent advent of fundamental innovations in agriculture that help with the collection of data about genes in animals, sometimes done with drones and robots. Issues have arisen relating to how those technologies are regulated. “The use of unmanned vehicles, specifically drones, will be absolutely game-changing,” said Connolly, noting that it is already occurring in plants and that robots are being used to milk cows. “This is a huge part of how agriculture is moving forward. Even more fundamentally, if we are now able to measure inch-by-inch, centimeter-by-centimeter the fertility of soils on a farm, is that data owned by the farmer, or for example by John Deere, or a food company such as a Nestle, or a seed company or the government?” asked Connolly. “That information is critical in terms of applying fertilizers better, getting the seeds to grow better, the use of new technologies increasing yields on that farm, potentially even the nutrients that are produced or grown into those crops that come from those soils. There are so many different avenues that technology is taking to revolutionize the way agriculture is done today.